Well loudmouth Haye has piped up again in preparation for his March 4th showdown with Tony Bellew but it appears he has forgotten who he's fighting trying to draw up interest in a potential showdown between himself and Anthony Joshua. "If AJ beats Klitschko, which I and the rest of Great Britain are hoping he does, any time he is ready to do it I am ready," the 36-year-old told Sky Sports News HQ. "I'd have fought him on my first fight back from retirement because I know I can beat him. "Hopefully, if he wins, his team will have the confidence - David Haye is the biggest fight on the planet, let's make it happen. The ball is in his court." Looking past Bellew could be very dangerous for Haye. The boxing legend ran a poll on Twitter asking the fans to vote on who his next opponent should be. Just under 45,000 fans responded with Khan the overwhelming winner over Kell Brook, Terence Crawford and Jeff Green. McGuigan wasn't surprised by the result -- but believes Khan shouldn't entertain the idea. "I would caution Khan against another high-octane super-fight off the back of a crushing defeat last time out," McGuigan said. "Khan can't help himself -- he loves the show. "But we saw when he stepped up from welterweight to middleweight to fight Saul Alvarez the dangers of biting off more than he can chew. "Even at this advanced stage of Pacman's career anything less than 100 per cent would not be good enough for Khan, and even that might not be sufficient." Junior lightweight world titleholder Vasyl Lomachenko, a two-time Ukrainian Olympic gold medalist and one of the best fighters in the world pound for pound, has a hard time getting top opponents to step into the ring with him. I suppose that's normal when your movement looks like something out of the Matrix. He initially targeted a rematch against Orlando Salido the man who handed Lomachenko is only professional loss in only his second pro fight but Salido turned down the fight. Next on the list was world titleholder Jezreel Corrales for a unification fight, but Corrales also rejected an offer. Lomachenko was happy to finally have an opponent. "I came to this sport to prove to myself and others that I am this big and loud champion. So, while all of you continue to hide from me, I am going forward to achieve my goals. My next step is on April 8. See you there!" British boxing is in an embarrassing state, since Calzaghe retired there have been no world class fighters. A few hyped up pretenders but no real deal. I want to see Chris Eubank Jnr v Andre Ward or Gennady Golovkin. But I think both will beat him. His dad has let family pride blind his judgement in his sons real skill level. Pretty sure the UK currently has the most world champions in boxing, can't be in that bad a state. Well when any one weight division has like 9 world titles through different organizations it kinda waters down being a world champion, unless you hold them all you are nothing but a paper champ. Joshua, Fury, Tony Bellew, James DeGale, Billy Joe Saunders, is Kell Brook still welterweight champion? Im not talking them all I think they only really list the WBA, WBC, IBF and WBO as he main titles. Plus how many undisputed champions are there period? deontay wilder just KOed Washington in the fif? He had been losing against a guy that was actually bigger than him but it only took one right hand. Should be some interesting heavyweight matchups in the future. Really needs to just tighten up his technique a bit and I think he will be hard to beat. Thought Wilder was going to punch him through the corner lol. Harrison clearly just came to do the chicken dance and get paid that night. Harrison was way ahead in that fight. Made Wilder look bad. Is Wilder ever going to face anyone good? Fury's reaction to being asked Widler or Joshua? Where you ask? Well it wasn't at his gym doing some training, it wasn't him going to speak to the British Boxing Board of Control to see about having his boxing licence reinstated. It was in a kebab shop! The former Heavyweight champion will have to cut down on his favourite junk food if he is to make his originally targeted spring comeback. And if he still wants a showdown with Deontay Wilder he will seriously need to get back to fighting shape. Looks like he's around 300 lbs. He is mirroring Naseem Hammed. Retire at the top of his potential (even though Naseem was genuinely a great boxer and Fury is a Lummox), get fat and become a lager lout. Haye KO'd by a cruiserweight lol what a can. I don't think they showed it here, or I missed it. Waiting for Thurman vs Garcia, show's just starting. Hate Haye but by the end we did feel very sorry for him fight was scrappy up until that point but there's no question he did injure something. Carl Froch says David Haye is "100 per cent" determined to fight again after speaking to the 36-year-old following an operation on his ruptured Achilles tendon. Bellew: "I don't know how many times more I can put my body and family through this," Bellew said. Yeah, that was the least twattish I've ever seen Haye be. Bellew's probably had his biggest payday in his life; Haye will be gutted he hasn't set up a money-spinner with Joshua (which was never going to be on the cards for Bellew). Did you see him after the fight they tried to plant the seed for a fight against Joshua and Bellew was having none of it haha "No no no I don't want to fight him"
Think he knows Joshua would murder him lol. I gave the fight to Thurman but it was close. It was the puncher getting the D against the counter puncher by being busier. Should be a rematch at some point. Deontay Wilder could be interested in a WBC heavyweight title defence against Tony Bellew, says the American’s promoter Lou DiBella. The Merseysider called for a fight against Wilder in the aftermath of his stunning 11th-round stoppage of David Haye at The O2 on Saturday night. Wilder has been ordered to defend his WBC belt against Bermane Stiverne after last month's knockout of Gerald Washington, but his promoter DiBella admits a fight against Bellew could be a future option. "We're not adverse to considering Tony Bellew," DiBella exclusively told Sky Sports. "We congratulate Bellew. I'm a big fan of Tony's. It's not something we would write off. "We respect him and it would certainly be something we would be interested in." Wilder was pictured with WBO champion Joseph Parker after his recent victory over Washington, with DiBella keen to arrange a unification fight, but Bellew would be a welcome addition to the shortlist of opponents. "A Joseph Parker fight would be the most desirable fight for Deontay next anyway, but you have to look at other alternatives. "A fight with Deontay and Tony would certainly be of interest. I just like Tony Bellew. He beat a guy who is a major player. Haye was a major player in the division and Tony beat him. "Does he deserve it? As much as any other contender would. He's had a great win against a very highly thought of David Haye. "He's also a guy that has got himself some attention. Being in that film doesn't hurt him. He's gone out there and become someone that is well known and he just had a great victory in the ring, where he showed a lot of heart. "We've got nothing but respect for Tony Bellew." Chris Eubank Jr., who recently just made a move up to super middleweight, is now looking even further up the scales as he targets Tony Bellew who is coming off a big win at heavyweight. 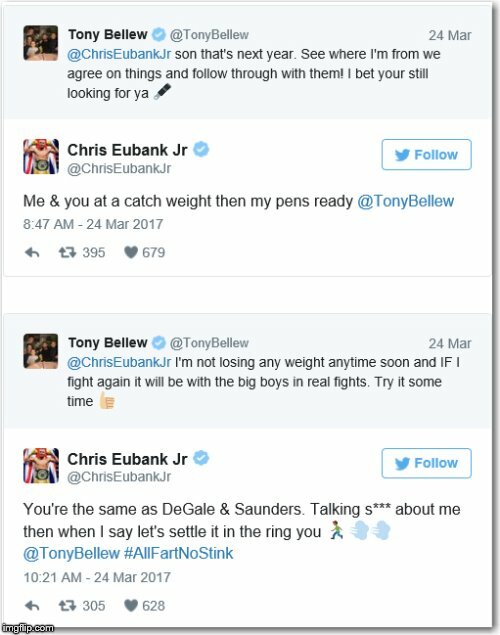 Eubank Jr. got into a Twitter spat on with Bellew before outright challenging him to a catchweight fight. But if you thought this was all superficial bluster (which it still could be), Chris Eubank Sr. actually called up Bellew’s promoter Eddie Hearn to inquire about making the fight happen. "Senior messaged me and asked if there were any legs in this and I was just - 15 stone and he wants to fight Tony Bellew? - A middleweight calling out a heavyweight? - I don't know what to say,"
"It was bizarre. And they are actually saying, 'do you want to have a chat about this?' and I'm like 'no.' I told (Tony) that (about the Eubank contact) and he was like 'what?' He just thought it was half a joke on Twitter. Anthony Joshua has responded to taunts from Tyson Fury by demanding a date when the former heavyweight champion will be available to fight him. Joshua, who faces Wladimir Klitschko at Wembley later this month in front of a post-war record crowd for a fight in Britain of 90,000, insisted Fury's inactivity is the only reason they are yet to meet. Comparing the muscular physiques of two fighters considered by some to be one-dimensional, the 28-year-old Fury wrote on Twitter: "Anthony Joshua is a poor man's Frank Bruno." The 27-year-old responded by saying: "Typical Tyson Fury, always talking BS around fight time. Same offer as last time. Two ringside tickets, don't bring a plus one, it's for your fat ****." Fury, who in November 2015 became the first fighter in 11 years to defeat Klitschko and transform the heavyweight picture into the one in which Joshua has thrived, then wrote: "I might be fat, but you're a paper champ and paper-chinned weightlifting rudeboy, wannabe badman. "Know your place chump! Or I'll come back and (KO) you." Finally, Joshua said: "Shut up and give me a date when you'll be back! "You're the only reason we haven't had a fight yet! Be about what you say. I ain't going nowhere." If Tyson can get his act together and make a comeback who do you see winning the grudge match? I could see this being the case, Fury has to be medically cleared before he can box again and I wouldn't be surprised if he needs to be cleared by a psychiatrist before fighting again. I don't like either guy, but I see Fury KO'ing Joshua. I think Joshua is untested and like 90% of British fighters is over hyped and starting to believe it before he beats anyone of note. So far has only fought one decent boxer in Molina. I could be wrong and he could be the next Ali, he certainly has the big head for it. I feel like this is a problem he has inherited from British boxing as a whole. But he's done nothing but floor everyone who's put in front of him. If he walks through Klitschko there is no denying it he's for real and he's is hear to stay. I give him that fight because Whyte wasn't the best competition he faced but it was the most personal he fought with far to much emotion in that fight. I can't see many others managing to get that reaction out of him. Promoter Eddie Hearn expects IBF and WBA world heavyweight champion Anthony Joshua will be back in action in October or November. Hearn told Sky Sports News HQ on Wednesday the Joshua camp will now take their time to assess their options but expects the fighter to face his next opponent in the autumn. "I think every fighter, after going through a fight like that, the first thing they tell you the week after is that they just want to get back into the gym, and they are going to do this, and improve on that, and they don't want too long to be laid off," said Hearn. "Then, after about five days, they turn around and say 'I want to go on holiday'. "So, we are on that period. I saw Anthony was swimming this morning and shadow boxing under water. "I am guessing in the next 48 hours, he will say 'I want to go on holiday, I need a break', so that will come. "Speaking to [Joshua's trainer] Rob McCracken yesterday - October, November, is probably the kind of date you will see Anthony Joshua back in the ring." Joshua's next opponent is yet to be decided, with Tyson Fury claiming he is ready to fight his British heavyweight rival without a warm-up match. Although Joshua and Wladimir Klitschko have just finished their epic fight there is already talk of a rematch with Wladimir supposedly having a rematch clause. While the mandatory challenger to the WBA 'super' belt that Joshua acquired on Saturday night, Luis Ortiz, has said he would beat Joshua within eight rounds. Kubrat Pulev is the mandatory challenger for the IBF belt. However rumours suggest Joshua would be willing to vacate this title to pursue a more lucrative fight. Then there is Deontay Wilder the WBC Heavyweight champion this could potentially be a massive UK vs. USA fight. Joseph Parker was recently crowned the WBO Heavyweight champion defeating Andy Ruiz. I think he will fight Fury. I like your spirit, but that is probably wishful thinking. I would expect Canelo to be the better fighter there. Yeah that or Ortiz I can't see him fighting Pulev nothing to gain. Going 8th/9th round stoppage for Canelo. stream me the fight on oovoo. I'm not paying Golden Boy a fecking dime.